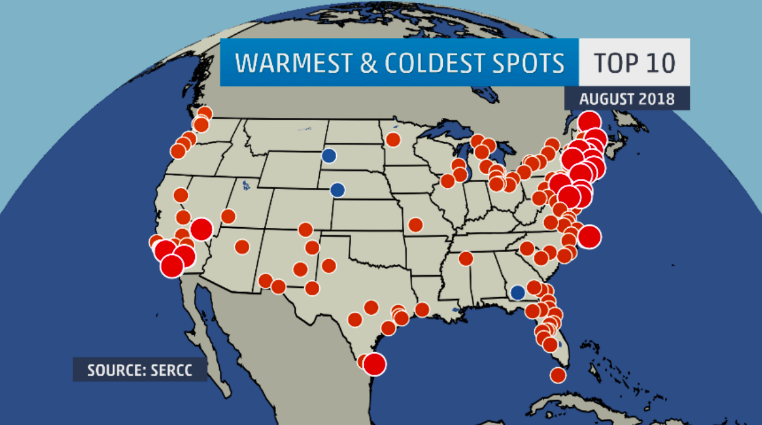 We’ll kick things off in New England, a place where many folks take their summer vacations to get some heat relief. Unfortunately, New England has been anything but a safe haven for forlorn travelers as month after month of unprecedented heat and humidity have gripped the region. Our spot for warmest in the country this month was sizzling at nearly seven degrees above their long-term August average, making for the warmest August on record. Situated right on the US-Canada border is the town of Frenchville, Maine – so we’re about as far north as you can get in the CONUS. However, latitude meant nothing this summer as both July and August were record setters for the town. 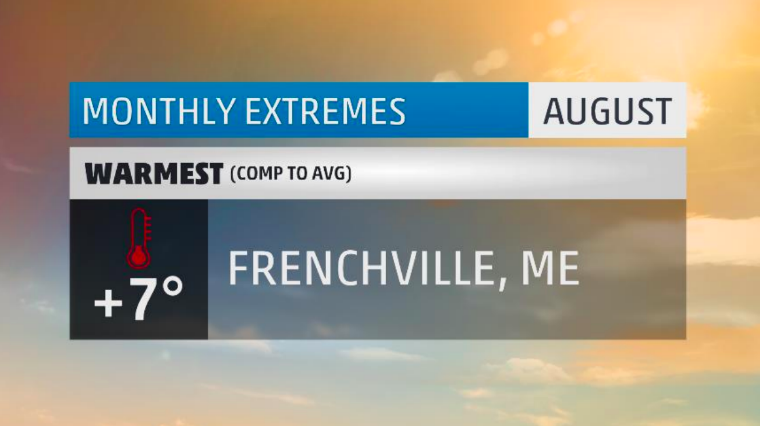 While August would come in as Frenchville’s 2nd warmest month on record, it was only shortly removed from the 1st warmest month on record: July 2018. Twenty-eight days in August featured temperatures that were above average. Two dozen highs temperatures and another two dozen low temperatures were warmer than the warmest respective average temperature for the month – a record for both. It was also a record for average low temperatures, including a new warmest overnight low of 69 degrees. Seven record warm lows would be set and another four record highs. A 54-day streak of 70-degree plus highs ended this month, making for the longest such streak on record. Among that streak were eight consecutive days of 80-degree plus temps – the most for any month. Sure, they weren’t suffering through triple digit heat, but for a place that is generally a respite from the heat, it was equally miserable. Outside of New England, brutally warm temperatures extended west into the Great Lakes, south in Florida, and all along the west coast. It was the warmest August on record in places like: Burlington, Boston, Atlantic City, Las Vegas, San Diego and Los Angeles. No surprise, August was the fourth month in a row where more places in the US were warmer than average. The first eight months of the year have been one big temperature ying and yang. All that being said, there were a few shots of season-changing cool air that spilled into the nation’s midsection during August. Our coolest spot in the country takes us to the Northern Plains where both June and July were hot, so residents were eagerly anticipating a fall preview. 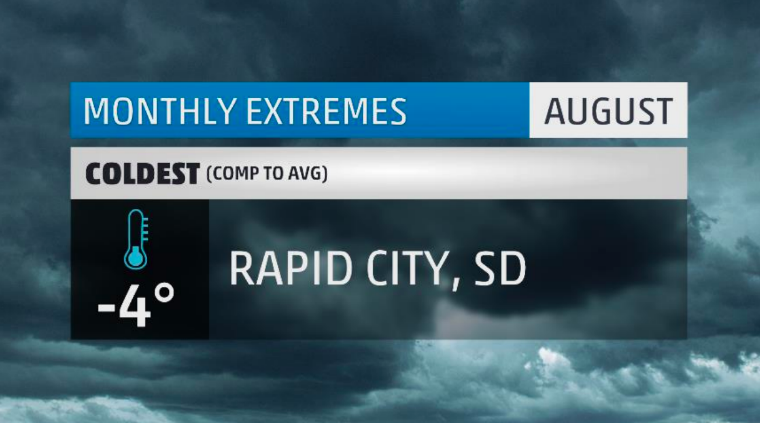 Rapid City, South Dakota had their 6th coolest August on record. The month featured 23 days where temperatures were below the long term average. In a normal August, highs range from 89 to 83 degrees and lows range from 59 to 53. (Author’s note: if you’re wondering why I wrote those average temperatures backwards, it’s because in some places of the US, we’ve finally turned the corner on average temperatures. Average temperatures will now being their gradual slide into winter as days get shorter and the air gets colder) This August, 14 highs were cooler than 83 degrees and 11 lows came in below 53 degrees. Five of those high temps were in the 60s – that’s the 2nd most for any August. Another five low temps fell into the 40s. Now that’s some nice sleeping weather! 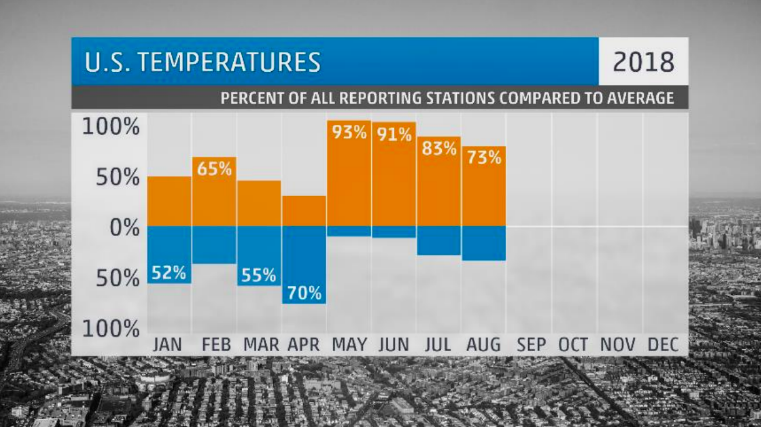 No temperature records were set during the month. In all, it’s hard to get cold air into the US in August, so even a four degree temperature departure is noteworthy. August opens the door to the influence of tropical entities making landfall, spreading heavy rains over a large area, and quickly amassing records as it goes. 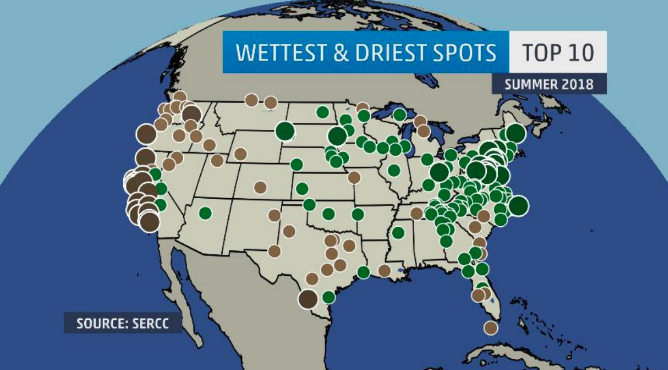 Our wettest spot in the country this month did so without all of that. Reading, Pennsylvania, situated just outside of the Philadelphia metro, saw week after week of heavy rains that led to numerous flash flooding events, creeks and streams flowing well over their banks, inundated roads and businesses, and producing scenes reminiscent of tropical aftermath. 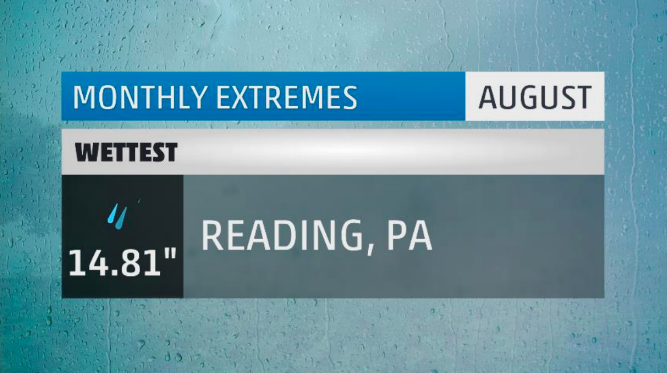 For Reading, it was their 2nd wettest August. The 14.81 inches that fell were just four one- hundreths of an inch off the high water mark set back in August 1955. That wet months was due to the landfalling Hurricane Diane. This August would also go down as their 3rd wettest month on record, only being beat by the previously mentioned August 1955 and Hurricane Agnes in June of 1972. 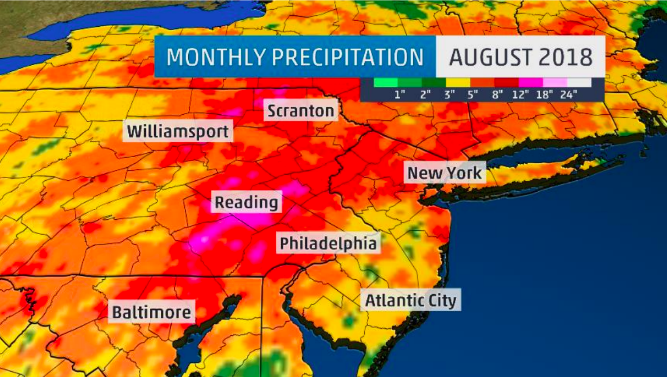 That makes this August the wettest non-tropical month on record. Seventeen days saw measurable rainfall including seven with at least an inch of rain and three days with at least two inches. In just the first four days of the month, Reading picked up five inches of rain. Much of the flash flooding is due to how incredibly yet the summer has been. At just under 26 inches, Reading had its wettest summer on record. If you total the rain from January through August, 2018 has already seen more rain than ALL of 2017, 2016, 2015, 2014, 2013, 2012, 2011, 2010, 2009, and 2008 individually. No surprise, Reading is on pace to have its wettest year on record. While Reading was wettest official station for the month, many smaller-order stations saw higher totals. For example, in-and-around south-central Pennsylvania, a few select locations picked up close to two feet of rain. A COOP station in Coatesville, Pennslyvania picked up 23 inches in August! That is an incredible amount of rain to see outside of a tropical event. A dozen locations would see their wettest August on record, including Reading, Concord, and Cincinnati. Another 137 would end up having one of their top ten wettest Augusts on record. As for the summer, 26 would have their wettest on record and another 140 would break the top 10. Well, it didn’t snow again – save for a few high elevation spots in the Rockies. Instead, we’ll take a gander at this month’s severe weather extremes. Quite an outbreak of severe weather hit Wisconsin on August 28th. 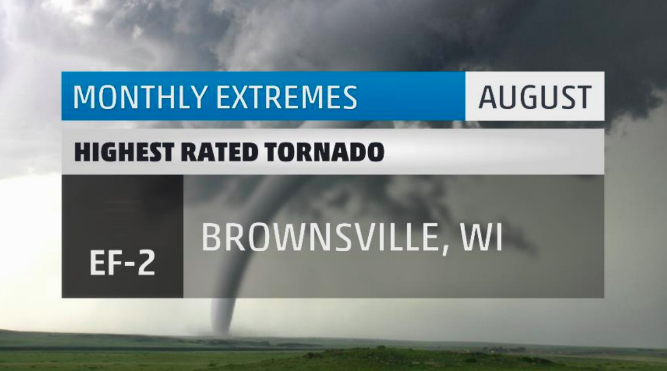 Twenty tornadoes would touch down including an EF-2 in the town of Brownsville. In Brownsville alone, some 200 trees would be toppled and power would be out for days. 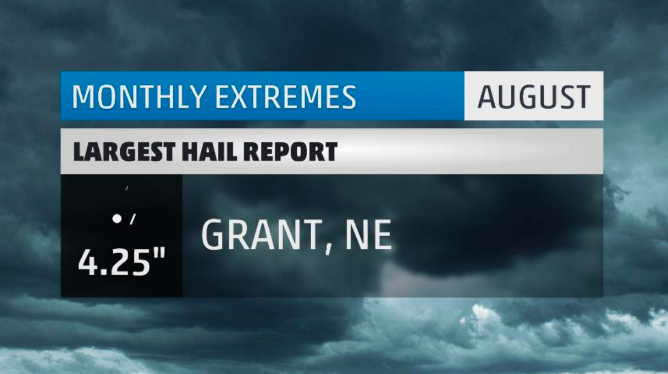 Grapefruit sized hail fell in the small town of Grant, Nebraska on August 6th. That’s more than big enough to destroy windshields and cause property damage to exposed structures. This wind report was accompanied by an EF-1 tornado. The tornado tracked only a few yards away from the local airport’s weather observation station, giving us an incredible close measurement of the storm. Numerous homes were damaged both from wind and from debris. August tornadoes are quite rare for Mississippi, and those that do occur are usually associated with land falling tropical systems. Since 1985, this is only the 4th non-tropical tornado to hit the area. 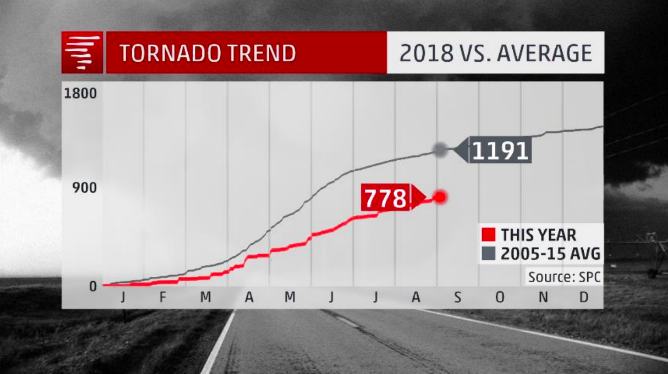 August was the first month all year to end with more tornadoes than the long term average. 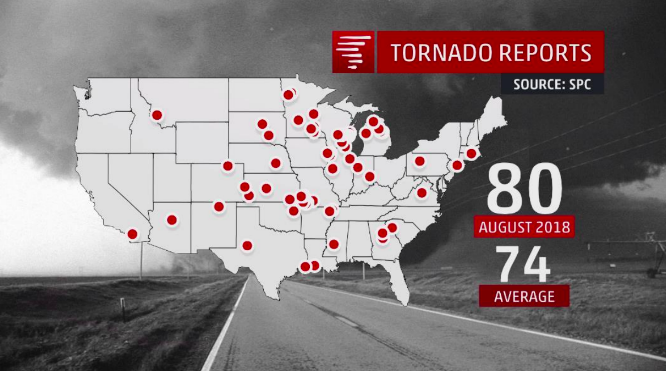 In all, 80 tornadoes would touch down in August. However, we are still well below average on the year. Our next stop takes us to sunny Las Vegas, well, North Las Vegas to be exact. All 31 days of the month were sunny, save for one day. On that day, a single pop-up thunderstorm produced enough cloud cover to keep North Las Vegas from being 100% cloud free. Only a trace of rain would fall that day, and that would be the only rain they would see for the entire month. All the sunshine made it blazing hot. Twenty-nine days had highs at or above 100 degrees. They would end August at just over three degrees above average. The area is currently under a severe drought, so a change in weather pattern would be much appreciated and welcome. And finally, we’ll switch gears from sunshine to gloom. Coming in with an impressive 16 days of complete overcast in the midst of 21 otherwise cloudy days, Eureka, California had its head stuck in the clouds. Due to a persistent on shore flow almost all month, Eureka could not shake the cloudy weather and was forced to live in the marine layer more days than not. 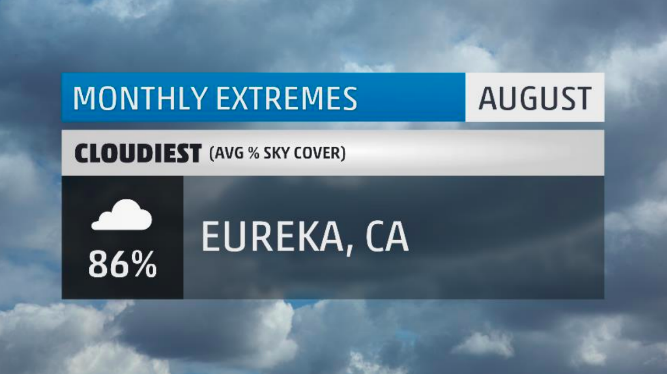 No shock that Eureka is California’s cloudiest city! Strange enough, August is typically their sunniest time of the year. Even with all the clouds, there were only three days of measurable rainfall. 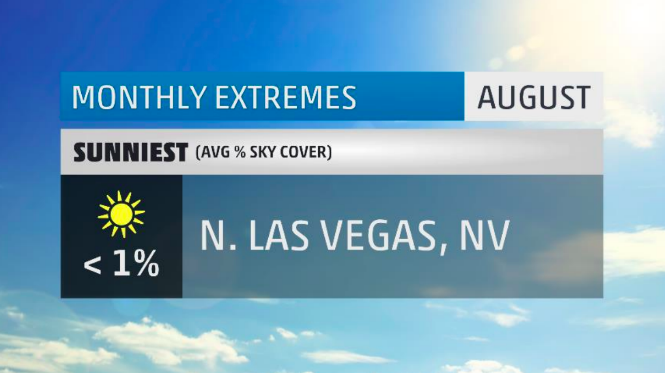 There you have it, the extremes for the month that was August 2018. Make sure to check back next month to see what September has in store! 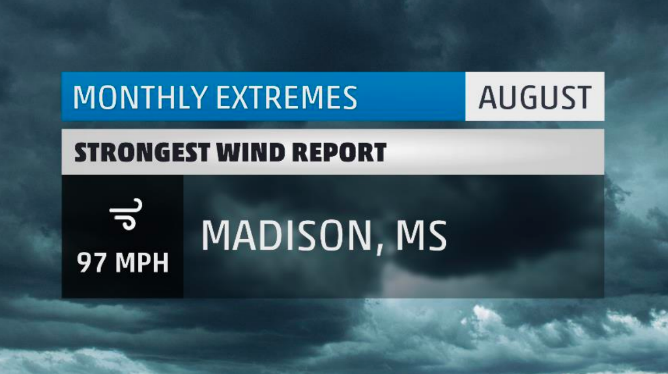 What weather extremes did you face in August where you live? Let me know in the comments below.